Oh the fun more headline writers could have had if only Stephen Elop, Nokia new American president and CEO, had stuck with his original job at Boston Chicken and Einstein Brothers Bagels, where he was CIO back in the mid to late-1990s. Instead, like all good technologists, the 46 year old Canadian Elop moved onwards and upwards, as CEO of Macromedia, president of Adobe Systems' worldwide field operations enablement group, and COO of Juniper Networks before becoming president of Microsoft 's Business Division in 2008. Now he's replacing Olli-Pekka Kallasvuo, Nokia's previous CEO, who failed in his promises to kickstart the company's terrible record in the US, as well as its lack of competitiveness in the smartphone business. After 30 years in the company, he's been duly booted out of its upper echelons, leaving the Nokia board of directors with immediate effect. He will continue to chair Nokia Siemens Networks' board in a non-executive capacity and receive a golden handshake of around 4.6 million. 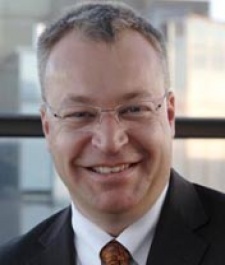 Elop will formally take up his new position on September 21, so presumably not be available for Nokia World 2010, the company's major business event, to be held in London on September 14 -15. "I am extremely excited to become part of a team dedicated to strengthening Nokia's position as the undisputed leader of the mobile communications industry, with a relentless focus on meeting the needs and expectations of customers," Elop commented. "Nokia has a unique global position as well as a great brand upon which we can build. The company has deeply talented and dedicated people, and I am confident that together we can continue to deliver innovative products that meet the needs of consumers." Sitting in his inbox will be issues ranging from the fast dropping average price of the handsets Nokia sells, to strong competition with Google and its Android OS, which is eating into Nokia's core smartphone market. Elop has plenty of experience of the disruptive power of Google from his time at Microsoft, where its online Google docs ate into sales of business software. On the plus side, Nokia's launching its new N8 smartphone, remains the biggest mobile and smartphone maker in the world, and has a strategic partnership with Intel to launch a new range of MeeGo mobile computing devices for the US market in early 2011.